Honestly, it's an even bigger deal than that. While a Franciscan "flush" of the membership of the Congregation for Bishops has been expected for months, the move's execution came with a flourish at Roman Noon as the Pope reshuffled roughly half the prior makeup of the all-powerful "Thursday table" that recommends nominees for episcopal appointments in the developed world. ...because in yet another show of his Wuerl-esque eye on the Curia he's inherited and aims to drastically reform, Papa Bergoglio simultaneously bumped both Cardinals Justin Rigali (emeritus of Philadelphia; the Congregation's secretary from 1989-94) and Raymond Burke (the Holy See's Wisconsin-born "chief justice," whose public outspokenness and effectiveness in moving appointments alike have long stoked either adulation or discontent in the church's polarized blocs) from the Congregation's roster. Likewise among those shuffled out was Cardinal Angelo Bagnasco of Genoa, the formidable president of the Italian bishops' conference. 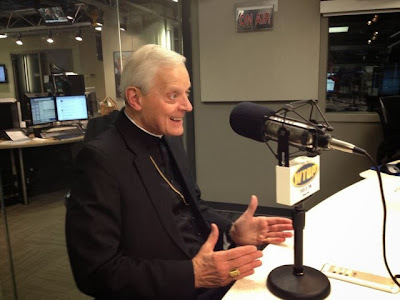 For those who enjoy what Italians do best, that Wuerl – already known to be a sought-out figure in Francis' orbit – has replaced Burke, his historic rival and cardinal-classmate, on the Congregation's membership is nothing short of extraordinary. 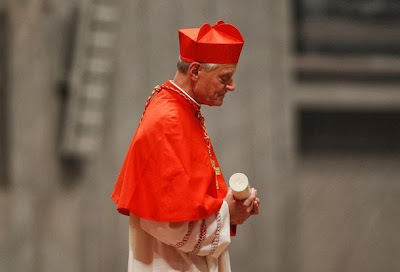 With today's nod, the District cardinal becomes the first shepherd of the nation's capital to have a seat at the Curia's most significant table of all; until now, only prior archbishops of New York, Boston and Philadelphia have known the role. Along with Wuerl, the Pope gave a nod to the West by confirming the now-retired CDF prefect, Cardinal William Levada, in his membership at Bishops. An LA native, Levada, 77 – who became the highest-ranking US prelate in Vatican history when Benedict named him as his own successor at the "Holy Office" after his 2005 election – now spends the bulk of his downtime at a long-held condo in Long Beach. A "raving moderate" just like Wuerl, Levada is believed to have had a key role in convincing Benedict to name The Donald to Washington in 2006. A year after Papa Ratzinger's election, the move marked the now-retired Pope's first major US appointment. Back to the Bishops' table, among others newly named to it include the neo-Secretary of State, Archbishop Pietro Parolin, the UK's top prelate – Archbishop Vincent Nichols of Westminster – the new head of the ever-rising Synod of Bishops, Archbishop Lorenzo Baldisseri, and Francis' trusted prefect of Religious, Brazilian Cardinal Joao Braz de Aviz. 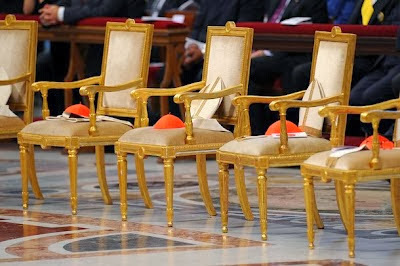 As previously noted, Francis has already announced his first Consistory to create new cardinals for next 22 February. The gathering will be preceded by what's apparently become a two-day summit of the entire College. The Senate's first meeting with the Pope since his election, the plenary's agenda is believed to be centered on the reform of the Roman Curia. Alongside the shake-up of the membership, Francis reconfirmed Cardinal Marc Ouellet as the Congregation's prefect. In September, the pontiff stunned observers by naming the Brazilian Msgr Ilson Montanari – a 54 year-old junior minutante (desk clerk) – as Bishops' new archbishop-secretary following Baldisseri's transfer to the Synod post. The move comes on the installation day of one of Francis' most prominent US picks to date, now Archbishop Leonard Blair of Hartford.